Following an accidental fire on its last floor in January, the Ritz Paris is scheduled to reopen in June 2016. The mythical establishment has been facing a complete makeover since 2012. Chef Nicolas Sale and pastry chef François Perret have been appointed to run the kitchen of L’Espadon, the fine dining restaurant of the hotel. L'Espadon, Ritz Paris 15, place Vendôme, 75001 Paris, 01 43 16 33 74. Alain Ducasse will preside over a modern café called Ore in the Palace of Versailles. It is scheduled to open its doors in spring on the first floor of the Pavillon Dufour, which is currently refurbished. Ore, Palace of Versailles Place d'Armes, 78000 Versailles, No phone. Nobuyuki Matsuhisa, owner of numerous restaurants worldwide, including Nobu in New York and Malibu, will launch his unique Parisian establishment in Le Royal Monceau - Raffles Paris. Named Matsuhisa, it will replace La Cuisine and is scheduled to open in spring 2016. Matsuhisa, Le Royal Monceau - Raffles Paris 37, av. Hoche, 75008 Paris, 01 42 99 88 00. Helmed by chef Yannick Alléno, Ledoyen will boast a new setting next spring. The dining room will be located on the ground floor and will seat diners in a contemporary décor. Moreover, a terrace will allow patrons to enjoy their meal al fresco. Ledoyen, 1, ave. Dutuit, 75008 Paris, 01 53 05 10 00. Presided over for years by Antoine Heerah, chef of Chamarré Montmartre, Le Moulin de la Galette has been recently taken over by a duo of managers, Cédric Barbier and Nicolas Tourneville. The establishment boasts a new décor as well as a new chef, Anthony Detemmermann, who honed his chops with Michel Rostang. Le Moulin de la Galette, 83, rue Lepic, Paris 75018, 01 46 06 84 77. 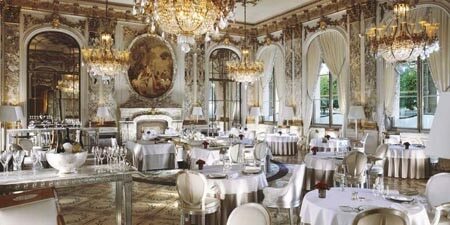 Chef Christophe Saintagne has recently quit Le Meurice to open his own restaurant, Papillon, in the 17th arrondissement. To replace him, Alain Ducasse has chosen one of his most talented stalwarts, Jocelyn Herland, formerly chef at Alain Ducasse at The Dorchester in London. Le Meurice, Hôtel Le Meurice, 228, rue de Rivoli, Paris 75001, 01 44 58 10 55. At 67, famous chef Michel Rostang has decided to step down in favor of his stalwart, Nicolas Beaumann. The latter has become the executive chef of Maison Rostang, which has recently changed its name from Michel Rostang. This gastronomic restaurant is nowadays presided over by the two daughters of Michel, Sophie and Caroline Rostang. Maison Rostang, 20, rue Rennequin, Paris 75017, 01 47 63 40 77.